BANGI, 11 June 2014 – The Tuanku Abdul Halim Mu’adzam Shah Campus of The National University of Malaysia (UKM) which is the Langkawi Research Centre has helped in the development of Kedah state. 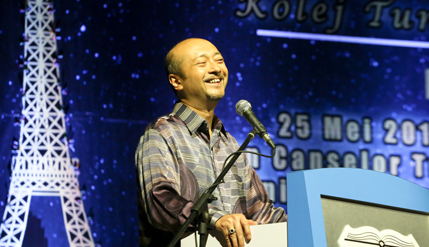 Menteri Besar Dato’ Seri Mukhriz Tun Mahathir, praised UKM for having a research centre on the island when speaking as the guest of honour at the Tun Hussein Onn College 17th Student Awards Night organised by the students held at the Chancellor Tun Abdul Razak Hall (DECTAR) here recently. Mukhriz said the state welcomed the willingness of UKM to contribute to the state’s development because Kedah is somewhat isolated from mainstream development. Contributions by UKM will assist the state to be on par with other more developed states in Malaysia. He praised UKM for being the ‘Guardian of the Nation’ and congratulated it for appreciating prominent personalities by naming two buildings in the campus after two former prime ministers Tun Abdul Razak and Tun Hussein Onn. The Menteri Besar also welcomed any move and event that helped in strengthening the close relationship between the government and students which enables both sides to exchange ideas for their mutual benefit. Such interactions will ensure a better understanding and provide exposure to the students on what was going on in the country. The students could also contribute ideas that can be applied to meet certain issues and problems that crop up. Vice Chancellor Prof Datuk Dr Noor Azlan Ghazali and Deputy Vice Chancellor (Students and Alumni Affairs) Prof Datin Noor Aziah Mohd Awal, the Principal of Tun Hussein Onn College, Assoc Prof Dr Samsul Adabi Mamat and Vice Principal, Zie Fazleen Hashim attended the function.